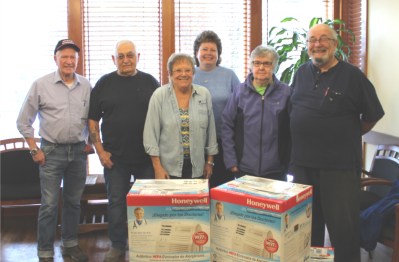 In the end of March, the American Lung Association in Montana reached out to help find new homes for ten HEPA air filter units. These units were previously used during the 2018 wildfire season in a Montana elementary school, but have plenty of life left in them. The ten individuals that received the units had initially requested them in August of 2018. At that time, they were placed on a waiting list after all of the available units were distributed to citizens across the state of Montana on a first come first serve basis. Upon receiving these additional ten units at the Center for Asbestos Related Disease (CARD), the ten individuals (only six pictured) were identified by Dr. Black, from the original waiting list, as having great likelihood of benefiting from a HEPA air purifier. HEPA filters, (high-efficiency particulate air filters) are very efficient at trapping microscopic particles in the air so their use can be extremely beneficial for anyone with lung disease, asthma or allergies with sensitivity to smoke, dust, pollen or other particles. “Significant wildfires have caused poor air quality from smoke and ash in many areas throughout the state over the past few years, many people were able to benefit from these filters, and we’re thankful that these individuals will now be able to benefit from them too,” said Dusti Thompson, CARD’s Outreach Specialist. CARD would like to thank the American Lung Association, the thousands of people across the country who donated to the Montana Wildfire Relief Fund, and the Montana Community Foundation for making it possible to give away these air filter units.